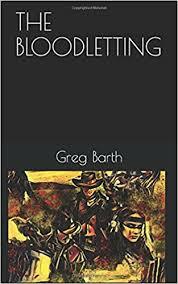 It was with some apprehension I tackled Greg Barth’s new release, TheBloodletting. Being that he has become one of my favorite authors due to my relenting love of the Selena series, I was nervous this new one might feel like a letdown. You know, the whole “I’m not into westerns” things? Well I am pleased to report The Bloodletting is not a western. Sure it takes place in a western setting during the Civil War and some might argue with me it is a western by pure definition, but I am here to tell you, in my eyes, this is really a tale of atrocities, revenge, family bonds, and the coming-of-age of a gunslinger. And it is one hell of a worthy book for Barth to showcase his talents in a new genre (Okay, I admit it, it is a western). This great piece of western-noir opens with a band of thieves taking refuge at the home of the O’Brien family. Looking to tend to a wounded partner, the thieves find a homestead without the presence of parents; just 2 young girls reside here after their parents have dies and been killed. The men take liberties with the girls and leave the home with the fresh murder of two young girls on their conscious. Word gets to Lew Younger, cousin to the girls who resides a state away, his help is needed. Being unaware of the atrocities committed upon them and being a young man who understands the obligations being family creates, he sets off to offer his support to his cousins. Riding with him two women; Ghose, a young hellion with a reputation of unchecked violence and penchant for whiskey, and Abetzi, a Comanche squaw who has fierce bonds of loyalty to the Younger clan. When Younger arrives at his cousin’s farm and learns of their fate, he swears revenge and sets out to find the hell-raisers who committed the sins against his family. Along the way he learns to sharpen his gun fighting skills, let his thirst for revenge drive him through periods of self-doubt, and also how to use his desire for retribution to go to any lengths to defeat men who have no qualms about killing women, children, and anyone else who gets in their way. I loved how Barth uses 3 different points of view in this book. We see the story unfold through the eyes on Lamar, semi-leader of the band of thieves, Rylee, the oldest of Lew’s cousins, and finally Lew himself who drives this story forward with his black and white view of the word around him. Barth switches into each point-of-view seamlessly and his strong ability to write from both the male and female perspectives allow each character to be fully fleshed out and jump off the page. I found this to be one hell of a page turner and it has perhaps the most gruesome torture scenes I have read in a long while. The violence the scene displays is unparalleled in the sense of its outright brutality and unflinching delivery. Being that Barth delivered us the Selena series, this statement should hold serious weight with you. This book is going to knock you down like a shot of buckshot to the face. Barth proves beyond a shadow of a doubt he can tackle any genre and leave the reader gasping for breath. This is a serious piece of literature and leaves the reader hungering for the next adventure of Lew Younger.